November 3 is the Christmas Extravaganza. Doors open at 10 on that day. New volunteers are always welcome. Call Michelle Recollet, our manager, at the store. Donation drop-off hours are 11-3. Use last rear door on Cavour Street. Dedicated to serving our communoity by providing low cost second hand clothes, shoes, household items, sporting goods, glassware, small furniture, appliances tools, books, and gifts. Proceeds help families with financial issues, and help non-profit organizations ministering to our local residents. We are also committed to helping worldwide missions such as Samaritan's Purse, Franklin Graham Ministries, to feed the hungry and bring the gospel to millions outside our country. We have given significant help and assistance to Hope Life Center in Antigo, a pregnancy counseling and support ministry. In 2017 we gave $20,000 to fund a mobile unit for Hope. 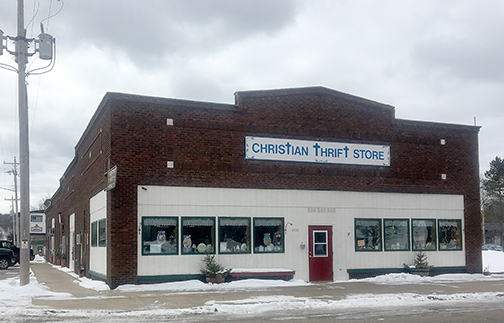 The New Hope Shelter in Crandon, led by Rev. Michah Dewing, receives monthly gifts of $250 from the Thrift Store. This shelter helps homeless individuals and families, and provides job counseling.